This week’s prospects include Juuso Valimaki (Tri-City Americans), Nicolas Hague (Mississauga Steelheads) & Antoine Crête-Belzile (Blainville-Boisbriand Armada). JuusoValimaki was new to the WHL and the Americans last season and managed to put up seven goals and 32 points in 56 games. His leadership is quite noticeable on the ice as he communicates well and shows emotion at both ends of the ice. He has since been rewarded with the “A” on his sweater this year. He’s a real mobile skater who loves to join the rush and catching opposing defencemen off guard by carrying the puck deep in the offensive zone and creating scoring chances. He has great offensive instincts and has the ability to skate back to his position with ease and get back into the play. Valimaki is not known as a flashy defenceman but displays patience and a calmness with the puck on his stick. He has crisp tape-to-tape outlet passes and always has his head up and rarely out of position. He doesn’t have an overpowering shot but with some work, it can be developed. DID YOU KNOW? 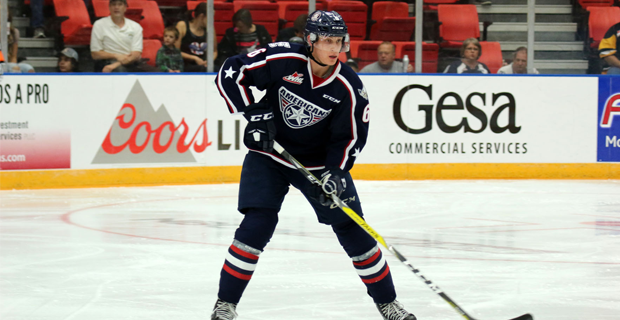 According to Tri-City Americans Broadcaster Craig West, Valimaki’s entire immediate family moved to the United States and the Tri-Cities area so they could be close to Juuso for the Americans’ 2016-17 season. 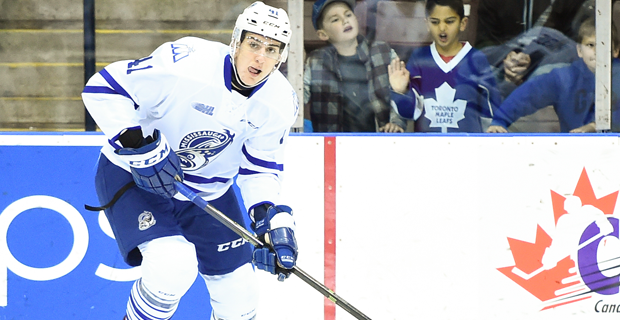 Another Top Prospect out of Mississauga this season, Nicolas Hague is a hulking defenceman who is capable of making his presence known every shift on the ice. He has the offensive capability to score the big goal and really likes to tee it up from the blue line as well as moving in from his point position to get a scoring chance. Hague runs the Mississauga power play, scoring 14 goals last season with five of them coming with the man advantage. He has good balance on the ice and knows how to skate himself out of danger and rarely makes a bad decision with the puck. Hague uses his long range to his advantage when the puck is in deep. The biggest question mark is his physical play and his skating. For a big kid, he doesn’t throw his weight around too much but has a bit of nasty streak. He skates well for his size and is quite mobile, but he will need to develop more to keep up with the pace of the faster players at the higher level. DID YOU KNOW? Hague earned OHL Scholastic Player of the Year honours achieving an 82% Grade 12 average at Philip Pocock Catholic Secondary School in Mississauga. He carried a full course load last season, studying pre-University Level Accounting, Canadian Law, Chemistry, Data Management, English, and Philosophy. Antoine Crête-Belzile impresses with his dynamic skating ability and has the mobility to join the rush and create scoring chances for his forwards. He likes the puck on his stick and does a good job of maneuvering around forecheckers to keep it. He has a great first pass tape-to-tape and follows his pass up rather than watching it. He has great vision on the ice and before making bold decisions, he makes sure it is safe to move the puck in deep or dump it in. Crête-Belzile likes to play the puck off the glass and chase it down. He has gotten caught down low that led to odd man breakouts the other way but has the speed to catch up and rejoin the play. He’s off to a slow start this season and doesn’t have the flash of a #1 defenceman yet but has the skill set and smarts to blossom into a reliable offensive defenceman. DID YOU KNOW? Crête-Belzile dressed for Team Canada at the Ivan Hlinka Tournament last August where he registered an assist in four games played. 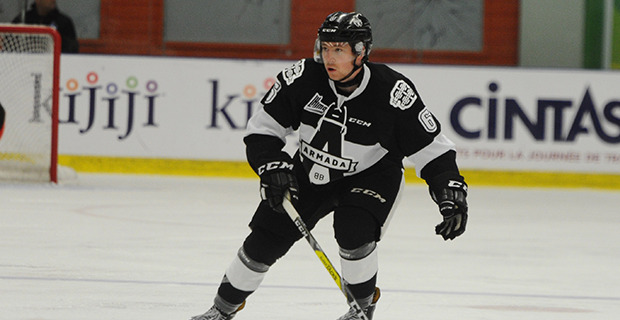 He was Assistant Captain and is regarded as one of the best skaters available in the upcoming NHL Draft.